SCVHistory.com LW3424 | William S. Hart, Ann Little in 'Square Deal Sanderson' (1919): Publicity Still No. A79-18. William S. Hart portrays the title character in the Thomas Ince production of "Square Deal Sanderson" (Paramount-Artcraft 1919), directed by Hart and Lambert Hillyer from a story by Charles Alden Seltzer (scenario by Hillyer). Original publicity still No. A79-18, 8x10 inches. In this scene, Mary Bransford (Ann Little) has a whole new outlook now that she has discovered Sanderson isn't her long-lost brother after all. Koszarski (1980) notes that rather than shooting scenes sequentially, Ince grouped scenes together by location — shooting all scenes that called for one location, then the next location, then the next location — which became standard practice in the industry but hitherto wasn't (pg. 111). 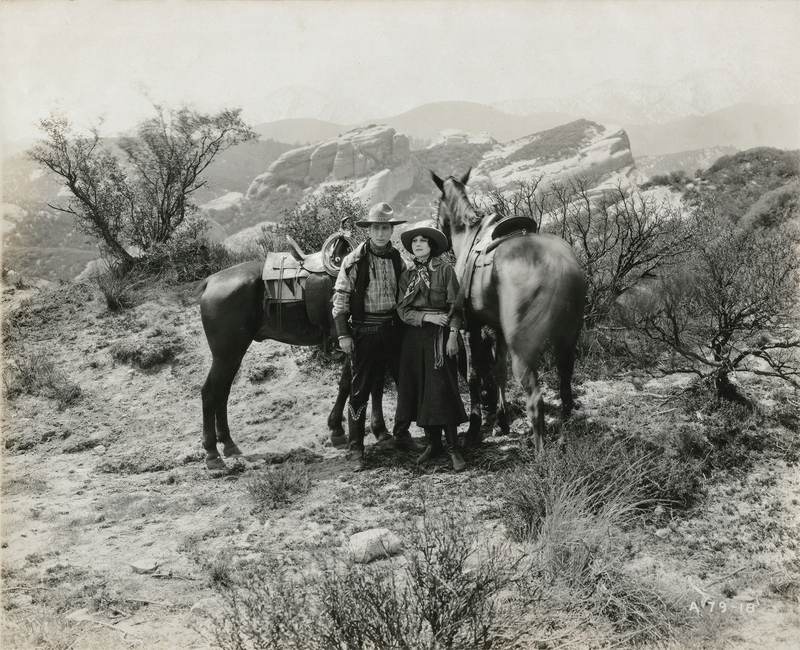 Ann Little, an outdoor woman who rode horses expertly, played opposite Hart in Square Deal Sanderson, a production that required Hart's unit to spend two weeks in the Mojave Desert. Square Deal Sanderson was a straightforward action movie and included a cattle roundup and plenty of fast riding and shooting. Hart played a cowboy who saves a girl's ranch by posing as her brother. In a dramatic moment the heroine is rescued when the tide character throws a lasso over the transom of a door and half strangles a villain on the other side. Produced by William S. Hart Productions; advertised as "supervised by Thomas H. Ince"; distributed by Paramount-Artcraft; released June 15, 1919; ©June 6, 1919; five reels (4800 feet). Directed by William S. Hart and Lambert Hillyer; screenplay by Lambert Hillyer from a story by Charles Alden Seltzer; photographed by Joe August; art director, Thomas A. Brierley; art titles by Irwin J. Martin. CAST: William S. Hart (Square Deal Sanderson/"Will Bransford"); Ann Little (Mary Bransford); Lloyd Bacon (Will Bransford/ "Barney Owen"); Frank Whitson (Alva Dale); Andrew Robson (Judge Graney); Edwin Wallach (Sheriff Maison). SYNOPSIS: Square Deal Sanderson comes upon the bodies of two men in a wild ravine and finds on one a letter from Mary Bransford to a brother she has not seen since a little child, but whom she hopes soon to meet, as she is being persecuted by Alva Dale, rejected suitor and villainous gang leader in a nearby town. Sanderson rides straight to her rescue and comes upon an act of cruelty in front of her house, where Dale is to hang one of her men, Barney Owen, for a trivial offence. She mistakes Sanderson for the brother she expects, and he allows her to think so until he disposes of her persecutors. Thereafter he attempts to tell her the truth in vain. Sanderson finds he is up against a very powerful leader in Dale, who gets his true identity when Barney Owen, [Mary's real brother, is in his cups. While the crooked sheriff jails Sanderson on false charges] the villains poison the water holes and destroy all of Mary Bransford's cattle. LW3424: 9600 dpi jpeg from original photograph purchased 2018 by Leon Worden.